Milica is not necessarily wrong to suspect her father’s new girlfriend Svetlana is a witch, because the strange woman’s apartment is filled with all sorts of weird New Age organic remedies that can’t possibly work according to science. 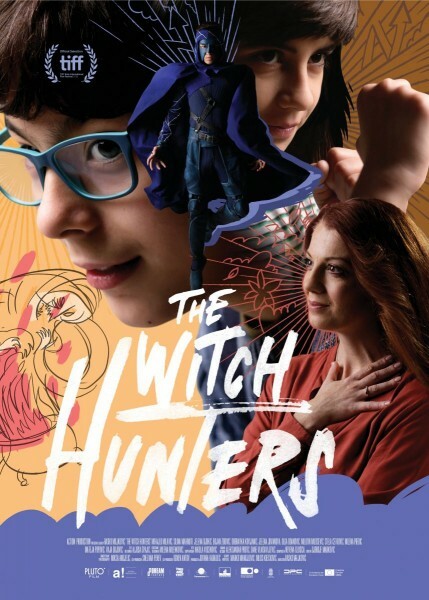 She has enlisted her school friend Jovan the dispel the witch’s mojo, but at least they don’t intend to burn her at the stake in Rasko Milijkovic’s The Witch Hunters, which screens during the 2019 Sundance Film Festival. Jovan is shy and standoffish in school, because he is insecure about his physical condition. However, Milica, the brash new girl, looks past all that. At first, Jovan is aghast when she starts inviting herself over, but he eventually starts to appreciate her tomboy attitude and self-assurance. Soon, Milica confides in Jovan she suspects Svetlana has cast an enchantment on her hapless father. It turns out, a video-game playing expert on all things super-hero like Jovan is just the ally she needs to take on Svetlana, assuming he can work up the confidence to take the bus by himself to carry out phases of their mission. Frankly, the key-art for Witch Hunter looks much more genre than the film really is. Basically, it uses fantastical elements in much the same way Ian Fitzgibbon’s Death of a Superhero did, but it takes the audience to a far happier place. Marko Manojlovic & Milos Kreckovic’s screenplay is achingly well-intentioned, but it skews considerably younger than a family film like the nifty ghost story, Room 213. Regardless, Mihajlo Milavic and Silma Mahmuti are enormously sincere and appear quite genuine on-screen as Jovan and Milica, respectively. They have a nice, believable rapport together. Most of the adults a well-meaning dunderheads or cold figures of scorn, but Jelena Jovanova shows some screen presence as Svetlana. Nice is definitely the word for Witch Hunters, with everything it implies, good and bad. There are some nice messages about inclusion here, but nothing you couldn’t find elsewhere. Mostly pleasant, but certainly not essential, The Witch Hunters screens again today (2/2) in Park City, as part of this year’s Sundance Film Festival.